American Heart Month is a time in which we must be mindful of our heart health and what better way to spread awareness than by making a delicious, heart-healthy meal for your loved ones? 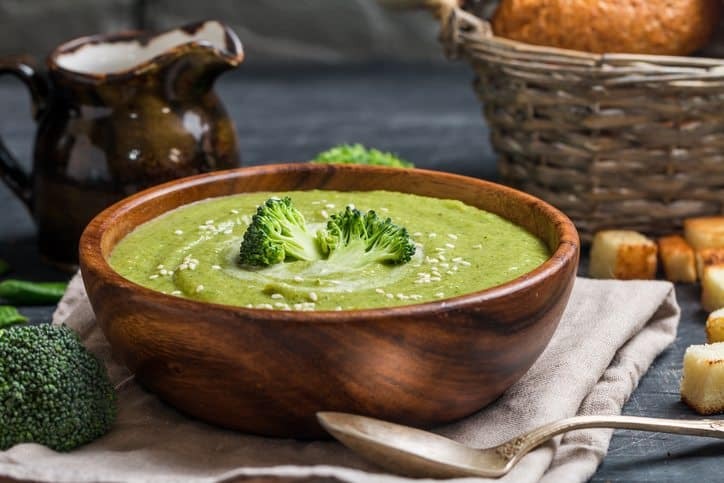 One yummy meal you’ll be thrilled to try is this broccoli, spinach, and kale soup recipe. Heart disease is an epidemic in America. The CDC reports that 600,000 Americans die from heart disease each year. These deaths are completely preventable—regular exercise and a healthy diet can easily make a huge difference in a person’s health. There are tons of heart-healthy foods that you can add to your diet to lower your cholesterol and help manage your high blood pressure, including broccoli, spinach, and kale. These three leafy greens are packed with heart-healthy nutrients and vitamins. Broccoli is rich with vitamin K and vitamin C, and it has anti-inflammatory properties that can help with your heart health. Spinach, with its high count of vitamin K and vitamin A, can lower your high blood pressure and also reduce stress. Kale is also full of vitamin K, vitamin C, and vitamin A and it can help reduce your risk of heart disease. If you’re ready for a heart-healthy, easy dinner, try this bright green soup recipe from Indy Power. Your heart will thank you! Add a tablespoon of coconut oil to a large pot on medium heat and add the garlic and onion. Sprinkle in the cumin and a good pinch of coarse salt. Stir well. Pop the lid on and let the onions soften for about 3 minutes. Remove the stalks from the kale. Add the broccoli, spinach, and kale to the pot and toss everything. Pour in the stock and stir. Adjust the heat to allow it to come to a simmer and then pop the lid on. Leave it to simmer for about 10-15 minutes, until the broccoli is tender. Don’t worry if the stock doesn’t cover all of the vegetables. Return the soup to the pot, on low-medium heat, and stir in the coconut milk. You can serve your soup with toasted nuts and tahini. Bonus. Don’t know what else to serve with the soup? Try cornbread or a side salad. Or you can serve it with baked salmon, the yummy fish that has omega-3 fatty acids that can lower high blood pressure, reduce blood clotting, and decrease stroke and heart failure risk.